Why is Duterte sending a pistol-packing peacemaker to Beijing when he already has an exceptional envoy there? So my editor asks me – what is a special envoy for public diplomacy supposed to do? The question is understandable. The Philippines already has highly respected former broadcaster Chito Sta. Romana as ambassador to Beijing. He speaks fluent Mandarin, has won an Emmy in news and documentary, is an economics graduate and on top of that has a masters degree in international relations from the US school for training ambassadors, the Fletcher School of Law and Diplomacy. What more could Duterte ask for? Ramon Tulfo, that’s what. He’s the exact opposite of the suave Sta. Romana. But even more important, his ties with Duterte stretch back years. Both were once educated in Ateneo de Davao University. Their families are close. To share what I know of Tulfo, whom I have interviewed in the past on the killing of journalists, I filed the story below. I also interviewed Center for Media Freedom and Responsibility chairman Vergel Santos to find out what he now thought of Tulfo, whose raw copy he once edited in the newsroom. My apologies to Santos. I did not know he was in New York where it was 4 AM when I phoned him. Below is my story explaining to a Hong Kong audience—Why Tulfo? 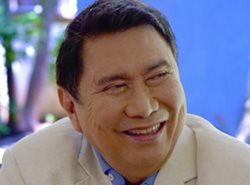 Broadcaster and columnist Ramon Tulfo has a reputation as a controversial firebrand but insists he’s really a ‘peacemaker’. President Rodrigo Duterte appointed Ramon Tulfo, 72, as the first special envoy for public diplomacy to China upon Tulfo’s request, the controversial Philippine Daily Inquirer columnist has revealed. Tulfo said Duterte, 73, wanted him to run for senator but he declined because he did not have sufficient campaign funding. “As a special envoy to China, which pays only P1 per year, I could retain my public service programme – Isumbong mo kay Tulfo (Complain to Tulfo),” he wrote in a column earlier this month. Tulfo would only get half that amount since the appointment is only for six months. Tulfo, who could not be reached for comment, did not say why. He said his work would begin as soon as Beijing accepted his credentials. As special envoy, Tulfo explained he would “facilitate applications and issuance of permits to Chinese investors”, in particular obtaining leases for idle agricultural land and fish ponds for contract farming. This would generate “millions” of jobs, he said. Tulfo, who was recently thrust into the spotlight for boorish behaviour inside a public hospital, said he intended to act as a “go between … in the event of diplomatic tiffs with China”. To read the rest of the article, please click on this link. Where can I buy you book Never Again? A contact in Manila will bring it to me. Thanks. Every moment of his loathsome stay , he is compiling more vulgarity. Where in the world does he get this perpetual foulness? I wonder why he is not running out of gross ideas. Walang natutuhan ang mga Pinoy sa taong ito and from his men mostly kabastusan and nonsense. I believed he is drawing on the Law of Attraction. “Like attracts like”, look around him, they are just similar in thoughts, words and deeds.Hear the celebrities attacking the decent people, they are acting like they’re the suffering victims. Agot is the only one on the bright side, most are being magnetized by this deranged man. Du30’s group of alike s ” TRIBE HIVE SYNDROME”. Wait until those around also darkened their skin for the mark to be seen. digong is egging people to spit at his face if they find disparity with his bank account. walang hidden wealth kuno siya; in that case, he can sign bank waiver. just sign bank waiver! and let’s have a look see. saying, walang hidden wealth kuno siya should be followed by his signing of bank waiver, words followed by action. before egging siya for military to hunta him, now egging the people siya to spit at his face. now po, is maybe good time for people to egg him to rebuild marawi city. anyhow, spitting at his face will not remove the uling, he, he, he. Another one of Duterte’s appointees who’d be embarrassing him in due time. Just wait for it! who knows? ramon tulfo might be able to pistol whip the chinese and help get duterte what he wants, he, he, he. I hear ramon tulfo’s chopstick diplomacy is to die for, chop, chop. yay, china opened the 55km bridge from hongkong to china. methink po, why in the name of the blighted durian would one want to travel by bicycle, car or truck all the way to china when you can travel by air which is lot faster, easier, more convenient and less tiresome? I got sea sick just watching the scenery and all that water, too much water! what to do with road rage? with nowhere to run and the exit is too far away, I guess, one just have to jump the bridge! much like the movie about crouching dragon and hidden tiger? I forgot the title of the movie. the heroine jumps the bridge and get her wish. goodbye life. he, he, he, maybe ambassador to beijing chito sta romana wants his toilet clean, kaya ramon tulfo it is. nalusotan si chito, gaya ni ex boc chief lapenya na nalusotan lang kuno according to digong. 11 tons of shabu napalusot ni lapenya, what a feat! You made a new word. Hmmm. yahoooooo! hot headed peace mucker, methink po, there is already enough pollution in china without ramon tulfo adding to their rank. way too much rubbish!